The Herbes de Provence among other things is what the Provence in France is famous for. The minute you step within a few metres of the entrance to La Source Parfumee in the village of Gourdon in the Provence, your senses are greeted with subtle smells of Herbes de Provence, and flower and fruit essenses. The Herbes de Provence is one of the things that many people relate to when they think of the Provence as well as fields of lavender. Herbes de Provence is an assortment of herbs mixed together which can include rosemary, basil, oregano, bay leaves, marjoram, lavender, thyme, and sage. 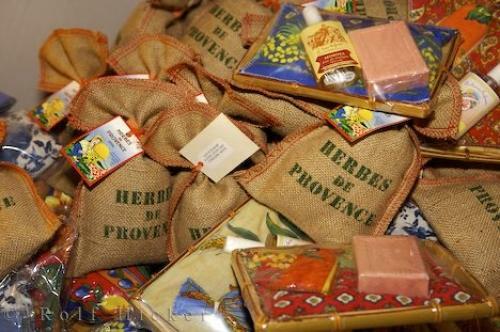 Throughout the many villages and tourists towns in the Provence, small jute bags of Herbes de Provence are for sale. In the village of Gourdon, La Source Parfumee prepares their own bags of Herbes de Provence from herbs grown in their own gardens. This boutique shop is also a Candle-making Workshop and old Distillery. The charming village of Gourdon is situated in the Alps Maritimes region of the Provence in France. Photo of small jute sacks of Herbes de Provence in the town of Gourdon in the Alpes Maritimes region in France. Herbes de Provence, La Source Parfumee, Gourdon, Gorges du Loup, Alpes Maritimes, Provence, France, Europe.